What is Aggressive Driving? Are you part of the problem? Aggressive driving is defined by the National Highway Traffic Safety Administration as the behavior of an individual who "commits a combination of moving traffic offences to endanger other persons or property." Speeding and other aggressive driving behaviors are among the leading causes of highway crashes and fatalities in Pennsylvania, however, many motorists don’t realize they're an aggressive driver. If you answer yes to any of these questions, you may be an aggressive driver and are putting yourself, your passengers and other people on the road at increased risk of a crash. To deter aggressive drivers and make Pennsylvania's highways safer for all who use them, PennDOT partners with Pennsylvania State and local police departments to conduct aggressive driving enforcement. Since the project was launched in 2006, more than 580 roadways have been targeted with additional enforcement and education. Learn more about the project here. - Get out of their way and don't challenge them. - Stay relaxed, avoid eye contact and ignore rude gestures. - Don't block the passing lane if you are driving slower than most of the traffic. - Do not attempt to follow or pursue the vehicle. You or a passenger may call the police. But, if you use a cell phone, pull over to a safe location. If possible, give the dispatcher the following information: vehicle description, license plate number, location and direction of travel, driver description, and the aggressive driving behavior being demonstrated. 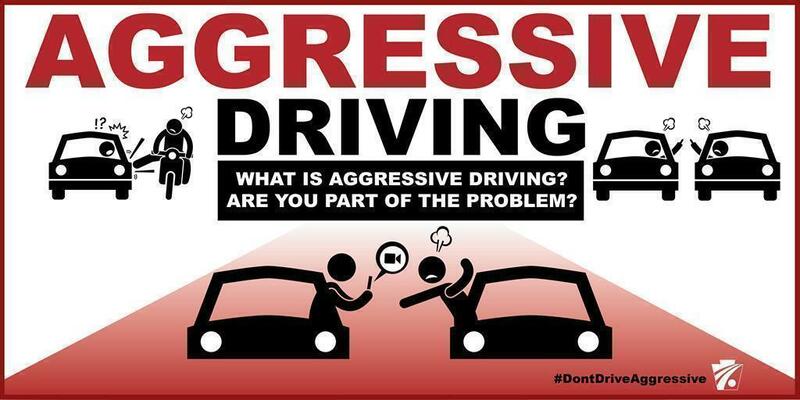 For more information on aggressive driving, visit www.penndot.gov/safety. Join the conversation on social media by using the hashtag #DontDriveAggressive. Follow PennDOT on Facebook, Twitter, and Instagram.